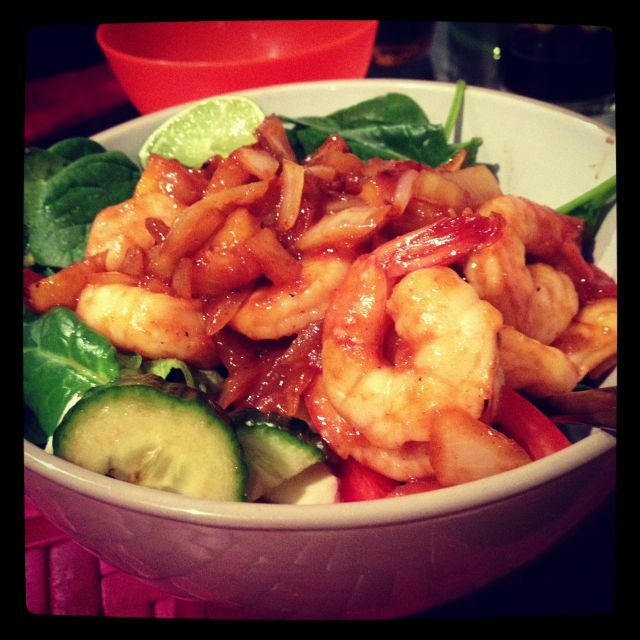 Paleo Sweet and Sour Prawns. We whipped up these paleo sweet and sour prawns and they were delicious. Enjoy served with steamed greens and fried cauli-rice. First up, marinade! Mix together the aminos, sweet chilli sauce, honey, vinegar, juice, paprika, one clove of garlic and chilli. Pour the marinade over your prawns in a bowl and mix carefully, making sure all the prawns get to taste the marinade. Set aside in the fridge. Meanwhile, on high, heat up your coconut oil and sauté one clove of garlic and onion. Add both the capsicums and pineapple and stir until heated through. Make sure your pan is hot enough and then add the prawns (making sure you get all that yummy marinade into the pan too). The prawns shouldn’t take long, about 3 – 4 mins, then turn them over and cook for a further 3 mins until they are cooked through.